Chokers were a staple of the 1990s and early 2000s, and the trend has made a roaring comeback! 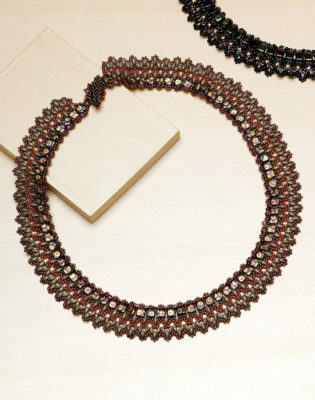 This collection of beaded necklace patterns includes four projects that exemplify the choker trend in unique ways. 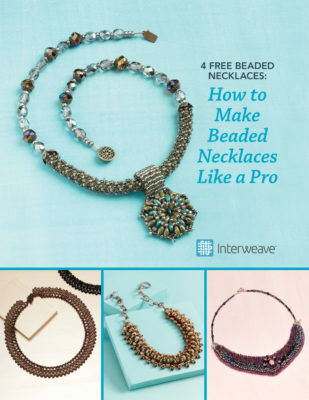 With this free beaded choker necklaces download, you’ll dive into necklace making and use beading techniques including bead embroidery, right-angle weave, netting, and more. Make Sharon Lester’s beautiful Aurora Borealis Collar with bead embroidery and iridescent beads in vibrant hues for a necklace that shines. Expertly combine Czech-glass shaped beads with gorgeous pressed-glass and fire-polished rounds when you stitch the romantic Fleur-de-Lis Necklace by Beadwork Designers of the Year Barbara Falkowitz and Amy Haftkowycz. Icelandia Necklace and Siren’s Medallion are the perfect complements to the other designs in this collection and offer even more ways to capture the appeal of beaded choker necklaces. 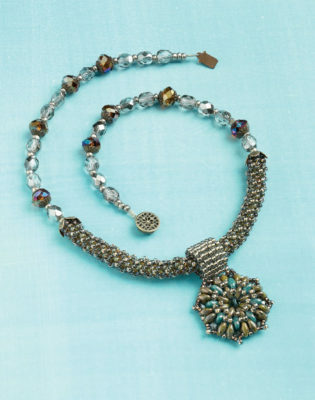 Enjoy combining circular peyote stitch with two-hole seed beads to create an elegant, ocean-hued medallion suspended by a square-stitch bail and strung with a netted tube and crystals. SuperUnos, O beads, and more. 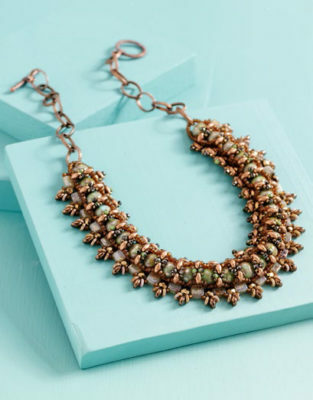 Resembling an Icelandic sweater, this right angle-weave necklace design incorporates two different two-hole beads. 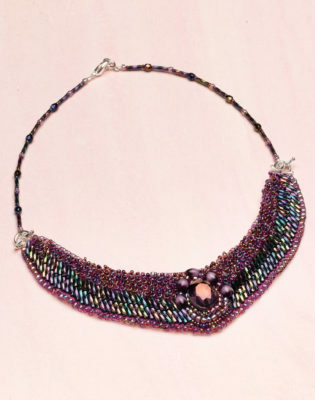 Use seed and bugle beads to bead-embroider this beautiful collar in iridescent hues of the northern lights. It has a unique strap that makes putting it on a breeze. So who’s with us? 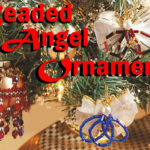 Jump into the trend, pull out your favorite bead combinations, put your beadwork skills into motion, then have fun showing off your handmade beaded necklaces!